Trey bans the other park animals from drinking from the pond. Plucky defies his authority and is chased by the furious stag. Shadow, Hurkel’s mate, takes a drink from the poisoned stream. 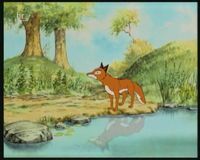 Hurkel is talking to a rabbit who has also been drinking from the stream but he notices that the rabbit is not acting normally. 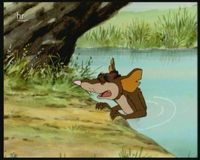 The rabbit suddenly drops down dead and Hurkel realises that it was the water he drank that caused it. 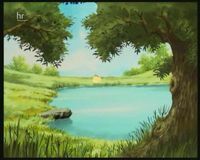 Hurkel stops Shadow from drinking, and takes her to the pond for fresh water but Trey furiously head butts Shadow into the pond as he wont allow her to drink from it. Suddenly Plucky turns up and encourages Trey to chase him again, allowing Shadow to escape. Shadow is dangerously ill. Mossy shows Hurkel and Shadow to an old badger set where Shadow can rest until she is better. Meanwhile, Whistler spots humans dumping poisonous waste in the stream, just outside the park. 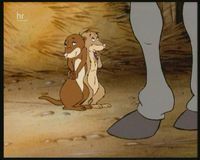 The weasel family take shelter from a storm, in the shed of a donkey named Colonel Donk. He lets them shelter as they get of the mice for him but when he discovers they kill the mice and eat them he is disgusted and throws them out, destroying his shed in the tantrum. The Weasels flee in fear of their lives.